Join Heather Markowitz for a family yoga class followed by a reading of her new book Let's Make Yoga Magic. Make yoga magic with the most beautiful and interactive kids yoga book out there! Pull the levers, turn the wheels, and watch as 13 adorable children come to life to act out yoga poses. A perfect tool for instructing and inspiring little yogis of all ages. 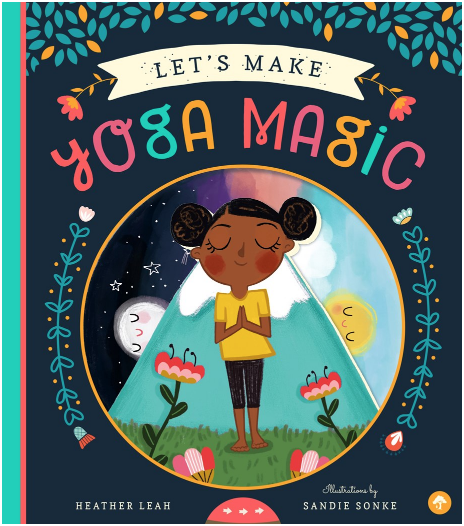 Make yoga magic with the most beautiful and interactive kids yoga book out there! Pull the levers, turn the wheels, and watch as 13 adorable children come to life to act out 13 yoga poses and create other yoga magic. Kids will delight in seeing the sun rise over the mountain pose, boats float beneath the bridge pose, and branches magnificently blossom when a child makes the tree pose. A perfect tool for instructing and inspiring little yogis of all ages. Heather Leah is a poet, teacher, behavior analyst, community organizer, and children's yoga guide in Washington, DC. She loves to play with paint, words, trees, and her friends. Being outside with her pup, Snoop, is her favorite activity. Raised in Connecticut, she has loved planting roots in the nation's capital since 2013. When she is not working with children, she organizes yoga and healing spaces across the DC area through her organization, WithLoveDC. Her mission is to spread love and smiles everywhere she goes. This event is FREE. Let us know you’re coming on Facebook.